If you were to ask my grandmother (or my mother -- or myself, for that matter) if she was "making chicken for dinner," she would grin and then reply, "Only chickens can make chickens. I am cooking chicken for dinner, though." The same would go for "making eggs" or "making bacon." And so I think it is rather funny and odd that this same grandmother had a recipe for "cucumbers." It would seem to me that a recipe is for something you make, not something you grow. 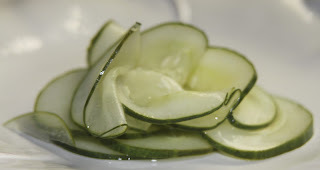 The cucumbers are sliced thinly and pickled ever so slightly in vinegar and sugar. And therefore, as far as I am concerned, by the time you are done, you have taken a cucumber and made something else altogether. The other day a friend mentioned that she makes "quick pickles" with her cucumbers, and although I am not sure her process is the same as my grandmother's, I think it is a perfect name and I am stealing it. They aren't exactly pickles. But they aren't just cucumbers either. They are just sort of pickly cucumbers. In this recipe, the vinegar is diluted with water, and I think that stops them from pickling all the way. Instead, they get a little limp and a little sweet, and although they are still very recognizable cucumbers, they need a new name. When I was young, and my mother would check my forehead to see if I had a fever, I got one of two reports back from her. If I was indeed running a fever, she would say "Oh, you're burning up." Otherwise, she assured me I was "Cool as a cucumber." (Which is either good news or bad, depending on if I was recovering from the flu, or trying to get out of going to school). These cucumbers are just like the idiom. Cool. They are refreshing and tasty, especially on a hot summer day, and are great alone as a snack or used as a relish or in a salad. I like to eat them with a sandwich, or a hunk of cheese and some nuts at lunch time. Bring the water, vinegar, and sugar to a boil. Pour over the cucumber slices and refrigerate for at least a day before eating.